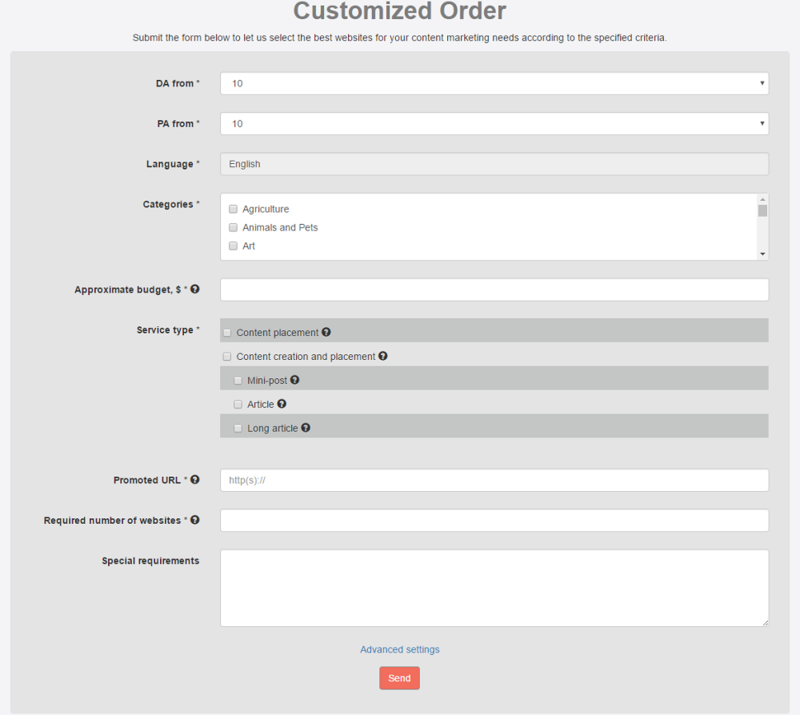 Today Adsy is happy to introduce you a Customized Order Feature. As you know, we are constantly working on the improvement of our system trying to make it convenient and efficient for all of our customers. This new feature is created with the purpose of making your content marketing campaign effortless and fruitful at the same time. Customized order has been created for marketers, who fail to find suitable publishers in Adsy open inventory. It may happen that the websites you, as a marketer, see on Search for publishers page are not relevant enough for your needs. In this case, you should check out our сustomized order feature by clicking “place a customized order” link. Why do you need a customized order? As you can see, Customized Order page looks a bit different from the one above, though many lines are the same. Why would you need a customized order then? It may happen so that sometimes you don’t have time to search for publishers, place your orders and follow all the steps of content creation and/or placement process by yourself. In some other cases, you may not be able to find publishers that meet your requirements in the inventory. The thing is there is a list of top-quality platforms, that don’t wish to be listed in the inventory for some reason. However, Adsy has their contact information and can reach them for you with the specifications you provide by filling in the customized order form. In this case, all you need to do is place a customized order defining all the things you expect from a publisher, and let us manually select the websites from outside the inventory. Give a detailed description of the task you need, and we’ll find the perfect match in a timely manner. We genuinely hope this feature will come in handy for you. Feel free to tell us what you think about it in the comments below or by writing to support@adsy.com.